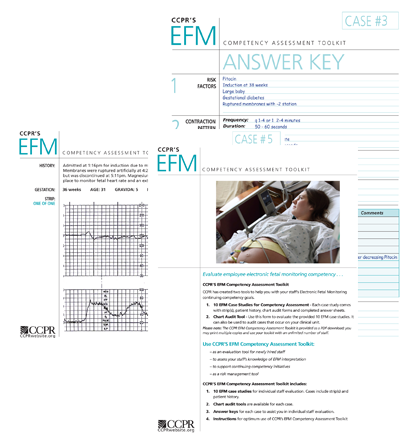 Evaluate employee electronic fetal monitoring competency . . .
with strip(s), patient history, chart audit forms and completed answer sheets. can also be used to audit cases that occur on your clinical unit. Please note: The CCPR EFM Competency Assessment Toolkit is provided as a PDF download; you may print multiple copies and use your toolkit with an unlimited number of staff. 2. Chart audit tools are available for each case. 3. Answer keys for each case to assist you in individual staff evaluation. This test has 125 questions. Returns: There are NO refunds or exchanges for any CCPR Study Workbooks, Online Modules or Audit Kits. © 2018 by The Center for Certification Preparation and Review (CCPR). These Practice Exams and the individual contributions contained in it are protected by copyright by the Publisher (except as noted herein). 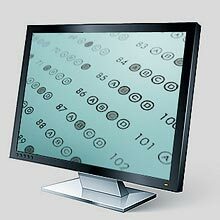 No part of this electronic publication may be reproduced or transmitted by any means, electronic or mechanical, including photocopying, recording, or otherwise, without written permission from the publisher. For information, write The Center for Certification Preparation and Review (CCPR), PO Box 827, Michigan City, IN 46361-0827. Our exam study workbooks will help you get a comprehensive review of the content areas covered on a NCC credentialing examination.